Burlington resident Donna Walters stood outside city hall on January 16, holding a stack of petitions above her head like a trophy. She was there to announce that her group, Keep the Park Green, had gathered the required 2,000 signatures — or 5 percent of the Burlington electorate — to put an advisory question on the Town Meeting Day ballot. Behind her, about 20 Keep the Park Green members cheered, waving signs with slogans such as "We speak for the trees" and "Let the people vote." On a portable speaker, the melodious voice of Joni Mitchell warned about the pitfalls of paving paradise. 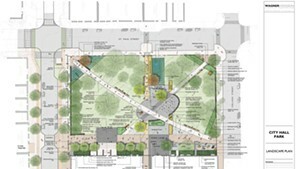 The group wants Burlington voters to cancel a plan to renovate City Hall Park that their elected representatives have already approved. "Democracy is not dead," Walters proclaimed to a small group of reporters. "Let Burlington voters weigh in on what we believe is a costly and poorly conceived plan and instead create ... a new and better plan for our park." In fact, the fate of the advisory question is up to the Burlington City Council, which will decide on January 28 whether Queen City residents should be allowed to second-guess its work. For the third time in three years, a group of citizens is trying to use the ballot to reverse a decision with which it disagrees. The wording and timing of that effort is generating vigorous debate about the public process and how Burlington voters should be able to weigh in. Vermont state law gives each community's voters the power to approve municipal budgets and infrastructure bonds. They also must green-light any changes to a city or town charter, because these involve altering government structure or authority. This year, for example, Burlingtonians will determine whether to create a new city Department of Permitting and Inspections. But residents have no power to make decisions about issues that are within the purview of their elected representatives. Citizens can petition to place advisory questions about local, state or national policy on the ballot, but the city council can decline to do so. The questions cannot be "frivolous or illegal," according to the Vermont secretary of state — that is, they can't put forward a measure that voters are not legally allowed to decide. Anything else is fair game. 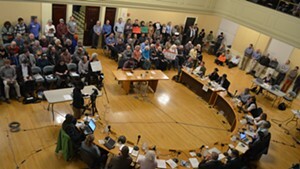 The practice of advisory votes has been gaining popularity in Vermont since 1982, according to Susan Clark of Middlesex, author of All Those in Favor: Rediscovering the Secrets of Town Meeting and Community. That year, more than 150 towns across the state asked residents to take a stand on the issue of nuclear proliferation. Although it didn't change the policies of then-president Ronald Reagan, Vermont's resounding anti-nuke vote attracted national media attention — a win, of sorts. In that same decade, Burlingtonians weighed in on everything from U.S. military intervention in Nicaragua to whether Burlington's nonprofit hospital on the hill should pay taxes. More recently, Queen City residents have used ballot questions to voice their opposition to the use of tar sands oil and to ask Congress to pass a constitutional amendment declaring that corporations aren't people. In 2012, they voted in favor of legalizing marijuana, supported a relocation of the bike path and asked for more affordable housing. In the past two years, however, the process has become increasingly contentious and politicized — in part because the "questions" have either sought to undo decisions made by the city council or urged it to act. In 2016, the council reluctantly approved a ballot question about whether the city should install bike lanes along North Avenue even though a pilot project was already under way. Last year, the council agreed to put a question on the ballot asking that the council cancel the arrival of the F-35 fighter jets at Burlington International Airport. The local governing body has no authority to change the federal-level decision. Councilor Kurt Wright (R-Ward 4), who voted against putting the question to voters, said that by allowing "editorializing comments" on the ballot, the council made a "precedent-setting mistake." In both cases, angry residents turned out with signs and insisted that the council put the measures on the ballot. This year's question looks like it's heading in the same direction. Burlington Mayor Miro Weinberger has argued publicly that residents have already weighed in on the future of City Hall Park. Starting in 2011, nearly 1,000 citizens submitted comments as the city conducted surveys and held meetings to plan a redesign. Feedback from Keep the Park Green members helped shape the nearly $4 million proposal that won the votes of 11 — of 12 — city councilors last June, Weinberger said in a news release published hours after last week's Keep the Park Green press conference. 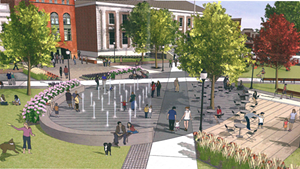 It features new walkways, a splash park to replace the central fountain, shrubs and plants, and public restrooms. 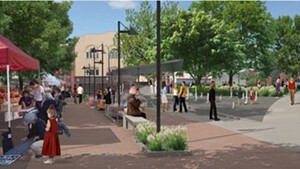 A citywide vote would not only cost additional taxpayer money by delaying construction at the park, which is scheduled to start this spring, the mayor wrote; it would also "cause enduring damage to the people of Burlington by sending the message to grant funders, donors, city staff, and other critical partners that no City Council decision is final, no matter how late a petition is made, and no matter the expense." But members of Keep the Park Green contend that they want all Burlingtonians to have a say. The 3-year-old group is also proposing an alternative park plan with more trees and shaded areas, less paved surface, and a lower price tag. "Find out how many people really agree with the plan — that's all we want," said Keep the Park Green member Charlie Messing. Jimmy Leas, a member of Keep the Park Green who also spearheaded the F-35 initiative, said keeping a question off the ballot amounted to "voter suppression." Even if a measure does get on the ballot and passes, the council doesn't have to act on it. And more often than not, it doesn't. No advisory vote since 2010 has led to a clear shift in policy, according to Weinberger and the councilors interviewed for this story. Moreover, the Vermont League of Cities and Towns website warns that selectboards and city councils should "be cautious" about what they put on the ballot because "voters will expect a select board to abide by the results of that vote, even if it is warned as a nonbinding article." "Ultimately, it's the job of the council and mayor to decide" those issues, Weinberger said. "I think, for these advisory ballot items to have the impact that's desired, it's important that they be timely, and it's important that they be written in a way that would give the mayor and the council advice that's helpful." Councilor Joan Shannon (D-South District) is not enthusiastic about the Keep the Park Green question. The wording, she suggested, is confusing. Suppose a voter wanted to cancel the current plan but didn't support the plan proposed by Keep the Park Green, suggested Shannon. How would that person vote? With mixed messaging, "We don't get any good information from referendums on the ballot," she said. The law has been back and forth on the issue of nonbinding advisory questions. In 2017, a citizens' group sued the South Burlington School District after its board declined to put a question on the ballot about replacing the Rebels school mascot. 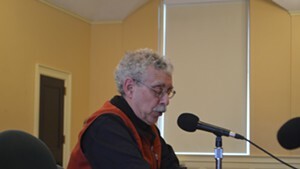 Superior Court Judge Robert Mello ruled in favor of the petitioners, saying the school board had to put the question on the ballot in deference to the Vermont Constitution. But last October, the Vermont Supreme Court overturned Mello's decision. "The Vermont Constitution created a representative, not a direct, democracy," the court wrote in its decision. When it came to deciding what should go on the ballot, officials "have discretion to act as they deem best." How will the Burlington City Council decide on the Keep the Park Green question? Wright said he wasn't sure whether he'd vote to put it on the ballot. "You've gone a long way on the proposal. You've spent a chunk of money. There's legitimate reason to not put it on the ballot," he said. 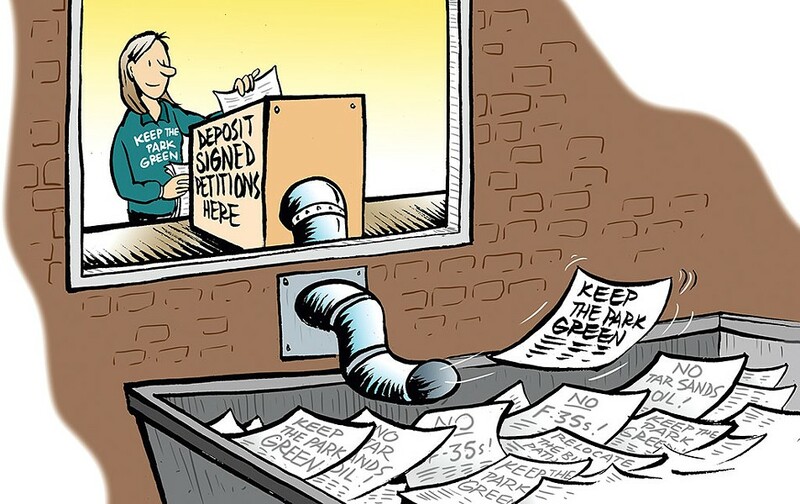 "At the same time, you feel bad to reject a proposal that citizens have worked on." Adam Roof (I-Ward 8) echoed Wright's concern. "Which public opinion should I choose to support?" he asked. "Both have the right to be heard." By putting the question on the ballot, he said, "We're walking eyes wide open into these debates that we know are going to tear our communities apart." Wright said he hopes to form a committee after Town Meeting Day to examine the referendum process. He said voters who want to put an advisory question on the ballot should be able to run the question by the council before going out and collecting signatures. That would give voters and the council a chance to discuss the question and whether it belongs on the ballot. Clark, the Middlesex author, suggested that there are better ways to poll the public. Too many nonbinding advisory questions, she said, "confuse us as citizens" because they reduce political discussion and policy making to sound bites. 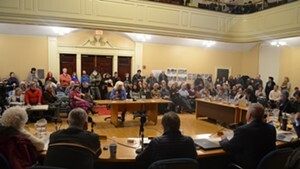 Town Meeting Day is "not a place to sound off," she said; "it's about governance." Activists and special interest groups love advisory ballot questions. But city councilors propose them, too. 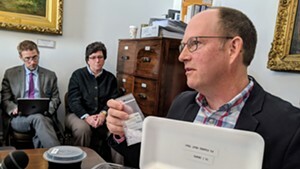 On Town Meeting Day, Joan Shannon (D-South District) and Adam Roof (I-Ward 8) want to ask Burlington voters whether they'd support a local ban on single-use plastics, including straws, Styrofoam and shopping bags. Chip Mason (D-Ward 5) and Karen Paul (D-Ward 6) are cosponsors of the measure. Shannon tried a different approach in 2016: She floated the idea of an ordinance prohibiting plastic bags in Burlington, but local shopkeepers said it would be detrimental to business. This year, Shannon said, an advisory question could be just what it takes. A thumbs-up from Burlingtonians could persuade the council to act — and help them decide how to do so. "The public buy-in is going to help move this issue forward," Shannon predicted.